. Shaanxi Statistical Yearbook-2018 is an annual statistical publication, which reflects various aspects of province’s economic, social science and technology development. The addenda include chronicle of events of Shaanxi Provincial Bureau of Statistics in 2017, chronicle of events of NBS Survey Office in Shaanxi in 2017, list of institutions of Shaanxi Provincial Bureau of Statistics and list of institutions of NBS Survey Office in Shaanxi.
. 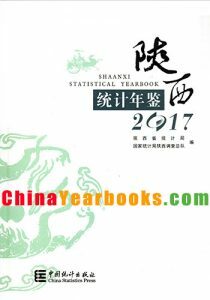 The yearbook is based on data of 2017. Each part includes statistical materials for historically important years, especially from 1978. Since then we have been implementing the reform and opening policy. .The Hancheng city has established the city specifically designated in the province plan in 2012. So, the main index by city(district) has added the data of Hancheng city in the yearbook. .The rough data of the nation and other provinces are taken from China Statistical Abstract-2018. The official data should refer to China Statistical Yearbook-2018 later. Ⅰ. Shaanxi Statistical Yearbook-2014 is an annualstatistical publication, which reflects various aspects of province’s economic,social science and technology development. The major data sources of the publicationare statistical annual report of different sectors. Also some other statisticaldata of city, county, and relevant departments are filled. 22. Main Indicators of National Economy byCountrywide, Province, Municipality and Autonomous Region. The addenda include chronicle of events of Shaanxi Provincial Bureau of Statistics in 2013, chronicleof events of NBS Survey Office in Shaanxiin 2013, list of institutions of Shaanxi ProvincialBureau of Statistics and list of institutions of NBS Survey Office in Shaanxi. As a matter of convenience for readers, We make Brief Introduction, abstract of major indicators andstatistical charts at the beginning of each chapter and explanatory notes onmain statistical indicators at the end of each chapter. Ⅲ. Theyearbook is based on data of 2013. Each part includes statistical materials forhistorically important years, especially from 1978.Since then we have beenimplementing the reform and opening policy. Ⅳ. The Hancheng city has established the city specificallydesignated in the province plan in 2012. So, the main index by city(district) has added the data of Hanchengcity in the yearbook-2014. Ⅴ. The roughdata of the nation and other provinces are taken from China Statistical Digest-2014. The official data should refer to China Statistical Yearbook-2014 later. “#” indicates that the major itemsof the total.